At the US Navy Memorial, step aboard your luxury coach for a narrated 6-hour tour of Washington DC, during which you’ll see a variety of monuments, memorials and state buildings, and make plenty of stops for photo opportunities. 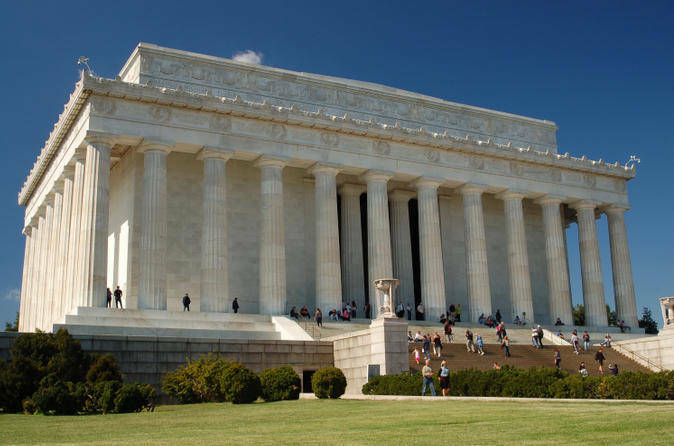 From your coach, see the White House, the many Smithsonian museums, the National Mall, Freedom Plaza and much more, and enjoy entertaining and informative commentary from your guide about the sights you see. Hop off your coach for guided walks around the US Capitol Building, the Lincoln Memorial, the World War II Memorial, the Marine Corps Memorial (Iwo Jima) and the Korean War Veterans Memorial. You’ll learn all about the history of these famous landmarks as you explore them up close, and your guide will answer any questions you have. During your tour, you'll have time for a meal. In the spring and summer months (March 15 - October 6), take in the fresh air on a scenic 1-hour cruise on the Potomac River and see Teddy Roosevelt Island, Netherlands Carillon, the Lee Mansion and the Potomac River, with lunch (available for purchase - not included in price of tour) on board. In the colder months (October 7 - March 14), stay warm inside an indoor courtyard and enjoy lunch (on own) surrounded by history.Your Washington DC tour ends back at the US Navy Memorial. Small carry-on bags are allowed, however it is recommended that you ravel lightly. Due to security concerns, the tour operator reserves the right to search any bags or purses you bring on board. Many of the attractions in Washington DC are equipped with metal detectors at the entrances. Traveling without bags or purses is recommended.